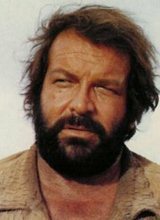 This engaging Spaghetti Western romp represents the career peak for the unlikely comedy team of Terence Hill (Mario Girotti) and Bud Spencer (Carlo Pedersoli). 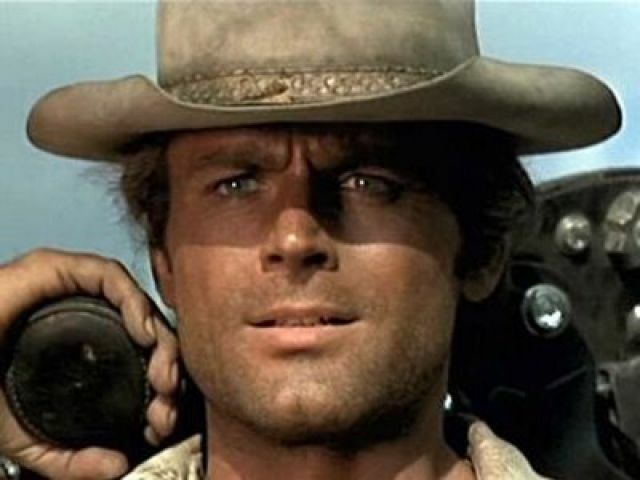 The blonde, handsome Hill and the dark, burly Spencer first appeared together in the 1966 Western God Forgives, I Don't (aka Blood River), which mixed comedy with violence. That formula spawned a moderately-successful trilogy starring Hill as a shady character called Cat Stevens (no relation to the singer!). 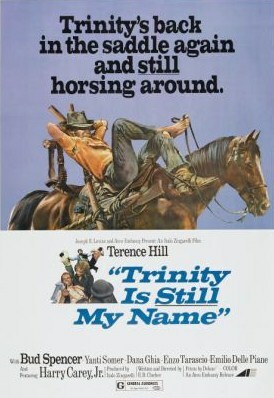 In 1970, writer-director Enzo Barboni toned down the violence, shifted the emphasis to physical comedy, and renamed the Hill and Spencer characters for his Spaghetti Western spoof They Call Me Trinity (My Name Is Trinity). The result was a European smash that demanded an immediate sequel. Two years later, Barboni, Hill, and Spencer combined talents again to produce the spirited follow-up Trinity Is Still My Name. It replicated the first film's success overseas, but generated only moderate business in the United States, where interest in the Spaghetti Western genre was waning. Still, it drew enough moviegoers to justify a re-release in which the two Trinity pictures were paired as a double-feature. Trinity Is Still My Name improves on the original film by wasting less time on plot. As in the Marx Brothers' best comedies, the storyline serves as a framework for the comic bits. There's nothing humorous in the central plot about crooked businessmen who use a mission as a "trading post" for laundering stolen goods. 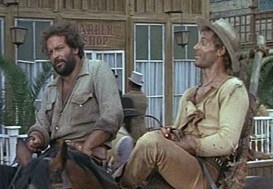 Instead, the film's humor is derived from the relationship between the two principal characters and their nonconformist attitudes toward life in the Wild West. Hill plays Trinity, a lazy, dirty, small-time outlaw sporting a bounty of only $50. He rides around in torn clothes and bare feet, lounging on a litter pulled by his horse or leaning back in a chair mounted on his saddle. He's an embarrassment to his older brother, Bambino (Spencer), who's trying to make an honest living as a horse thief. However, the boys' father convinces Bambino to take on Trinity as a partner. It's hard to see Hill's "Paul Newman"
In traditional comedy terms, Spencer plays the straight man in this "odd couple" comedy team. His character initially appears to be the one with the brains (Bambino certainly thinks he is). However, we soon learn he's no match for the quick-witted Trinity, who subtly ignores his befuddled brother's plans. It's an interesting twist for the funny man to also be the smart one. In such an arrangement, there's the potential for the straight man to become expendable. Yet, Spencer makes the gruff Bambino likeable, in part because he seeks a simple life of crime, even though he's not very good at it. The film's funniest scene sends the two brothers into a posh restaurant to spend some of their poker winnings on a good meal. Writer-director Barboni sets up the sequence by showing us an earlier "family dinner" in which Trinity, Bambino, and their parents fight over food as they chomp, grunt, and guzzle like a bunch of pigs. Hence, we know what's in store for the snobbish restaurant patrons as soon as the two brothers enter the high-class establishment. This scene, like most of the comic routines, relies very little on dialogue--an approach which probably contributed to the film's success when dubbed into other languages. At almost two hours in length, Trinity Is Still My Name runs out of inspiration with a half-hour to go (amazingly, the original Italian cut runs seven minutes longer). Still, it ends on an upbeat note with a zany climax in which Trinity and Bambino play football with a bag of gold as a dozen bad guys chase after them. Hill and Spencer followed up the Trinity films with less-popular contemporary comedies such as All the Way, Boys! (1973) and Watch Out, We're Mad (1974). The 1974 Western My Name Is Nobody paired Hill with Henry Fonda in an entertaining yarn about a retiring gunfighter. Three years later, Hill took a shot at stardom in the U.S., teaming up with Gene Hackman for the Foreign Legion film March or Die and with Valerie Perrine in the comedy Mr. Billion. Both films flopped miserably and the blue-eyed Terence Hill returned to Italian comedies. Spencer has enjoyed a solid career as a supporting actor in such films as The Five Man Army. He even played the lead in the contemporary Italian films Charleston and Flatfoot (aka The Knock Out Cop). Good post, Rick! I like how you highlighted a pair of spaghetti western stars who don't normally get a lot of love. While I'm not a huge fan of the TRINITY movies (I wish Barboni had put that violence back IN), I do like MY NAME IS NOBODY. Talking about Terence Hill's attempts to make it in the U.S....I remember going with my parents in the early 1980s to see the Italian cop comedy SUPERFUZZ at our local theater...so someone was trying their best to make Hill a successful star in the U.S. As you say, it didn't work out so well. It didn't help that SUPERFUZZ was unrelentingly silly. Jeff, I'm also a fan of MY NAME IS NOBODY, a clever satire on the perils of celebrity (it'd make a good double-feature with the underrated Charles Bronson Western FROM NOON TILL THREE). Yes, the contemporary films by Hill and Spencer just weren't as good, though I'm now in the mood to see ALL THE WAY, BOYS again.